Our Great Expectations series has been really popular with over 2000 reads already! Next in the series we have a bit of a hero of mine! Professor Stuart Warden is a Physical Therapist, researcher and deputy editor for BJSM. His paper on bone stress injuries in runners (Warden et al. 2014) is one of my favourite articles and surely a must read for anyone treating runners. So I was absolutely delighted when he agreed to answer our questions on what to expect following bone stress injury. Be sure to follow Stuart on Twitter via @StuartJWarden and check out his extensive collection of research. Missed parts 1 to 3 in this series? Check them out HERE for expert guidance on achilles tendinopathy, hamstring injuries and ACL surgery. How long might you anticipate rehab to be for someone with this condition? A bone stress injury can range from a bone reaction (painful bone without a crack) to a more advanced stress fracture (painful bone with a hairline crack). Typically, bone reactions heal faster than stress fractures so the early a diagnosis is made the quicker the recovery. However, not all bone reactions and stress fractures are created equal. Treatment and recovery can vary greatly depending on which bone is affected and also where the injury is within the specific bone. The location of the stress injury determines whether the stress injury is at a low or high risk of progressing. High-risk stress injuries occur at specific sites, such as the front of the shin bone (anterior border of the tibia), upper aspect of the hip (superior cortex of the femoral neck), and navicular and fifth metatarsal within the foot, to name a few. Bone stress injuries at these sites often require specific, aggressive intervention such as surgery or prolonged immobilization and rest which may last up to 6 months. Fortunately, high-risk bone stress injuries are not common in runners. The rest of this contribution focuses on the more common low-risk bone stress injuries. They are termed low-risk as they occur at sites that readily heal, such as along the inside edge of the shin bone (tibia), in the outside leg bone (fibula) and in the middle metatarsal bones towards the front of the foot. Bone stress injuries at these sites heal without specific treatment and with a period of modified activity. The rehabilitation time for a low-risk bone stress injury can vary depending on whether it is a more simple stress reaction versus a more advanced stress fracture, but the typical healing time is 6-8 weeks. The first stage of the rehab is to make an accurate diagnosis. The diagnosis of a bone stress injury is usually made via clinical examination by the presence of pinpoint bone tenderness and from what the runner tells the health care provider. Imaging is not usually necessary and does not necessarily inform what needs to be done when the bone pain is at a low-risk site. If imaging is performed, it usually starts with an x-ray; however, many bone stress injuries are not visible on x-ray, particularly during the early stages of the injury. An absence of any findings on x-ray does not mean the injury is not present. An MRI may be ordered, but is often not necessary and represents an extra expense. Once a diagnosis is made, the next step is to make a treatment plan. Historically, a bone stress injury at a low-risk site meant complete rest for a set number of weeks before having the athlete simply return to their normal running. We now recognize the adverse physiological and psychological effects of complete rest in runners, and encourage return to some form of running as soon as possible. This is achieved by slowly introducing running and closely monitoring pain at the bone stress injury site. The first step to returning to running is to be pain-free during normal activities of life, such as general walking. If a runner is not pain-free during normal activities, they may use crutches or be provided a boot for temporary use. These may be used for a week before reassessing to see if they can now walk pain-free. During this initial period and throughout the entire rehab process, fitness can be maintained with water running and stationary bike work. Water running takes a little practice, but is particularly useful at mimicking some of the mechanics of normal running without the associated impact loading. Once a runner is pain-free for 5 consecutive days of usual activities, they can start specific graduated loading program which has the goal of introducing controlled, progressive loads to the injured site. There are many variations of graduated loading programs and they can be individually customized; however, one that we like involves 30 minute sessions separated by rest days. The first stage begins with walking for 30 minutes and progressing to increasing durations of jogging (running at 50% of normal pace) and decreasing durations of walking. The second stage involves progressively increasing the pace of running until running for 30 minutes at usual pace, with the third stage consisting of running on 2 consecutive days followed by a rest day. The final stage incorporates individualized running until complete return to desired running activities. Progress through each stage of the running program is determined by pain at the bone stress injury site. If a runner is able to complete a session with no pain and does not experience latent symptoms (i.e. pain later that day/night or the next morning/day), they can safely progress to the next level of the program with the knowledge that the injury is tolerating the load. If, however, pain is experienced at the bone stress injury site they must immediately stop the session and, at the next session, return to the previous level they were able to successfully complete. Progress is through the program is often linear; however, setbacks do occur, especially early in the program when the pathology can be a little more finicky. The key is to progress only as fast as the pathology will allow by paying attention to pain provocation. Low-risk bone stress injuries do not typically present a major concern in terms of failing to heal or progressing to a complete fracture. However, it is not uncommon for a runner to experience another bone stress injury in the future. These are not usually a recurrence of the original stress injury as they occur at different location within the bone or in an entirely different bone, but they indicate that whatever contributed to the initial injury was not adequately addressed. What factors might have a negative effect on prognosis? As low-risk bone stress injuries readily heal, prognosis is generally very good. However, recovery can be delayed by progressing too quickly through a graduated loading program by ignoring or not appreciating the presence of bone pain, or by trying to do too much too soon. Similarly, factors that influence normal bone healing may influence bone stress injury healing times, including smoking, diabetes, poor nutrition, compromised underlying bone health, and endocrine disorders or dysfunction, to name a few. The latter three have particular relevance in female runners who have relative energy deficiency (i.e. a deficiency between dietary energy intake and the energy expenditure required for health and activities of daily living, growth and sporting activities). What factors might have a positive effect on prognosis? Currently, there are no approved techniques to accelerate bone stress injury healing. Some researchers have explored the effect of bone stimulators (such as low-intensity ultrasound and electromagnetic fields). We do know these modalities do no harm, but we do not know if they are effective at reducing healing times. Some individuals have tried pharmacological agents/drugs (such as parathyroid hormone), but again there is no evidence these work for bone stress injuries. Training program design: runners need to watch their training program so that acute loads (i.e. loads over the past week) are not more than ~10% higher than their chronic loads (i.e. average loads over the past four weeks). Loads here can be defined by distance ran per week as well as the intensity/pace of running. Only one of these should be changed at a time, with increasing distance usually preceding any increases in pace. Bone health and nutrition: a DXA scan may be used to see if there is underlying poor bone health, particularly in females considered to have relative energy deficiency. For more information on bone stress injuries I once again recommend Stuart’s 2014 paper, you’ll get a lot out of it! 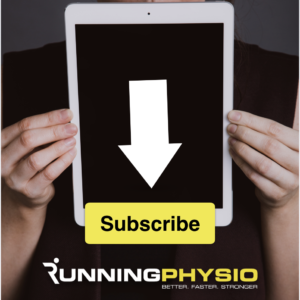 Coming soon… we’ve just receive an interesting guest blog from top physio and runner Scott Newton revealing a surprising reason why he developed a stress fracture and we also have part 5 of this series with Anthony Teoli discussing OA, watch this space!